On January 9, 2011, Mars Express passed Mars' moon Phobos at a distance of only 111 kilometers. 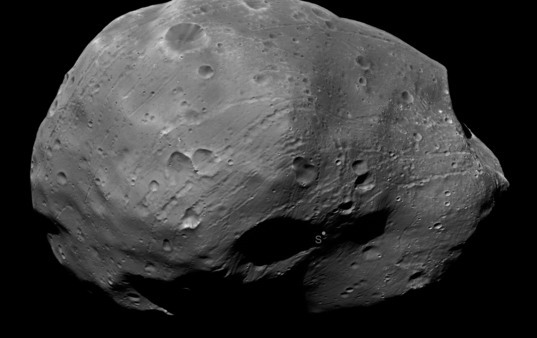 This photo shows the south side of Phobos at a resolution of 8.2 meters per pixel; visit the Mars Express blog to see it at its full resolution of 4.1 meters per pixel. The south pole is marked with a dot and an "S" inside the large crater near the center. Stickney crater, which is positioned at the center of Phobos' leading, Mars-facing quadrant, makes the bite out of the upper right of the globe. But what I think is best about this particular set of images is that they serve as really great illustrations of how HRSC works. It's an unusual instrument: a pushbroom camera that acquires simultaneous stereo and color data with a higher-resolution framing camera bolted to it. If you don't understand what that preceding sentence means, bear with me; I'll explain. Below the rectangular box of the HRSC detector is a circular barrel with a lens, which looks more like a regular camera. In fact, that part of HRSC, called the Super Resolution Channel (SRC), is a framing camera, the sort that does take snapshots. SRC's images are 1024 pixels square. The pixels are nominally 4.45 times smaller than HRSC's -- 230 HRSC lines cover a single SRC frame -- but the SRC turned out to be out of focus, so in flight its level of detail is little sharper than HRSC. Other parts of the camera that you can see in the photo include the silver instrument frame, which supports the camera heads. 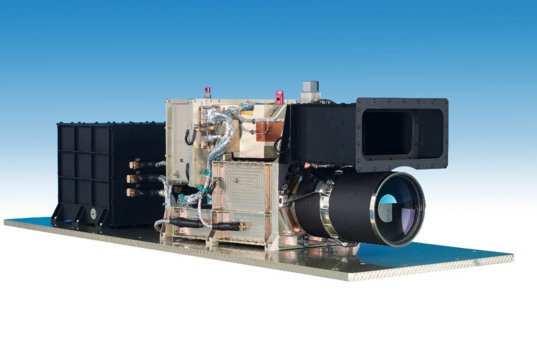 The black box in the rear is the cameras' processor, which performs JPEG compression (reducing images in size by a factor of 4 to 10) on the images before they are sent to the spacecraft computer to be relayed to Earth. OK, so those parts of the camera system are pretty similar to ones I've described before. But HRSC doesn't just have one linear detector; it has nine, all of which sweep along the surface as Mars Express orbits, catching nine overlapping images. What makes HRSC really unusual is that the nine detectors are all pointed slightly differently. Three of them are pointed "nadir," that is to say straight down from the spacecraft to the surface, which is the usual direction for cameras to be pointed. But three of them are pointed at an angle ahead of the spacecraft, and three of them are pointed at an angle behind the spacecraft. Here's a diagram. HRSC is a pushbroom camera that builds up long images as it flies above the Martian surface. When it is at its closest approach to Mars, at 250 kilometers, the swaths are 52 kilometers wide. HRSC has nine channels: five panchromatic and four color. The five panchromatic channels are pointed at different angles -- one nadir, two forward, and two backward -- which allows HRSC to do near-simultaneous stereo imaging of every spot it photographs on Mars. The blue and green color channels are near-nadir, while red and infrared color channels are pointed forward and backward along-track, respectively. This unique design permits HRSC to do something no other Mars camera can: it can (and does) obtain 3D views of every spot it images on Mars. To get a 3D view, you need to look at a spot from two slightly different directions. Other Mars orbiters can only do this by imaging the same spot on Mars on two different orbits with two slightly different look directions. Mars Express does it all at once. Say, for instance, that Mars Express is passing over a volcano, coming from south to north. First its forward-looking stereo channel will image it from the south; seconds later, its nadir channel will image the volcano as Mars Express passes directly overhead; and then as Mars Express departs, it'll image the volcano from the north with its backward-looking stereo channel. The stereo channels are pointed about 19 degrees forward and behind the spacecraft. There are two additional channels positioned at slightly smaller angles, which the HRSC team calls "photometric" channels; together with the nadir and stereo channels they allow the HRSC team to study how the Martian atmosphere affects the view of Mars' surface when looked at from five different directions nearly simultaneously. When Mars Express flew past Phobos, then, Phobos swept through the field of view of each of HRSC's differently-pointed detectors at different times, resulting in the camera getting nine distinct points of view on the moon. Here are the five panchromatic views. The perspective on Phobos really shifted a lot, didn't it? 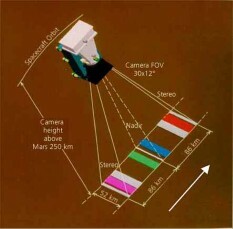 Mars Express' HRSC has five "panchromatic" detectors that each look down from the spacecraft at a different angle: there is one nadir (straight-down) channel, two "stereo" channels S1 and S2 that are each angled forward and backward along the spacecraft's path at 18.9°, and two "photometric" channels P1 and P2 that are at slightly smaller angles. As a result of these different look angles, Mars Express saw Phobos from five different perspectives. This instantaneous stereo capability makes color images slightly difficult though. Because the red, green, and blue channels are all shot from different perspectives, the HRSC team actually have to build digital elevation models before they can create good color images, unless the terrain is particularly flat. For this series of images, Phobos apparently rotated so much from channel to channel that it will take considerable processing to craft a color version of the view, and I note they didn't bother to try to release a color version with this set of observations. While Mars Express takes images with its High-Resolution Stereo Camera, it usually also takes detailed snapshots with its Super-Resolution Channel. Here, seven SRC images taken during the January 9, 2011 flyby of Phobos are superimposed upon the HRSC view. All in all, an illuminating set of images from Mars Express; it's clear they'll have Phobos well mapped for Russia's Phobos-Grunt mission!